This is tutorial about how to Tunisian Crochet a simple bow. Tunisian (or Afghan) Crochet makes a beautiful and squishy texture. 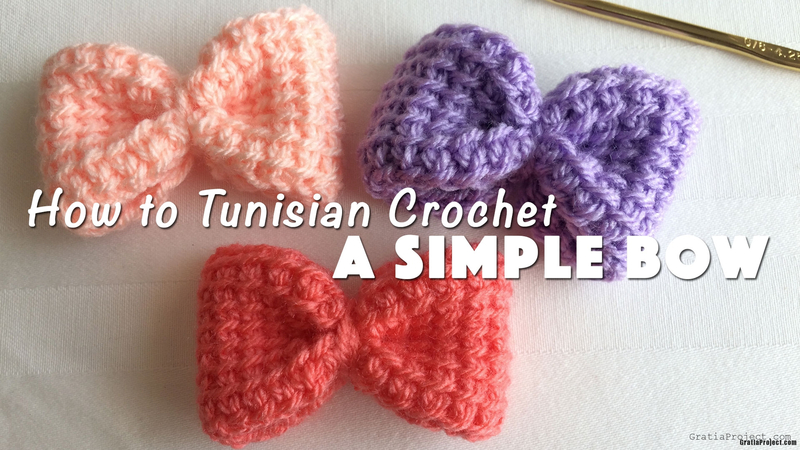 Learn how to Tunisian crochet and make simple bow that can be used for any project. In this tutorial, I used Stylecraft Special DK yarn (color: Shrimp, Apricot, Wisteria), and Boye Crochet Hook G-6/4.25 mm. Step 1: Start from 2nd ch from the hook, pull up a loop in each chain. Keep all 10 loops on hook. Now you repeat step 1 and 2. Step 1: Start from 2nd vertical bar from the hook, pull up a loop in each vertical bar. Keep all 10 loops on hook. Next we working left to right. Repeat step 2. Continue doing this until you have 24 rows. Cut the yarn, leaving an 8 inches tail. Using tapestry needle, sew both sides and shape your bow. Please subscribe for more tutorials.